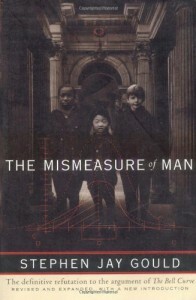 Before a proper summation can be given, one first has to understand the Why of The Mismeasure of Man. The Why being hundreds of years of conservative, white-folk-do-well-because-they're-smartest ideology supported by "science", and the more recent belief in the existence of an inherited IQ number by which all humans can be ranked, culminating in The Bell Curve, by Herrnstein and Murray (1994). It is a book that asserts poor people are, in short, intellectually inferior to the non-poor, and thus can never rise above their status (barring some fluke) to achieve the success that wealthier people enjoy. The book was roundly criticized as sloppy, statistically inaccurate, and pandering to a conservative audience that wanted to believe the poor were not worth the money spent on them, with Gould as one of its loudest critics. In sum, Gould's book is a admonishment of The Bell Curve and the willingness of social scientists to shape their findings to fit their narrative over the past centuries of anthropological research. In essence, they found what they set out to find (support for white, Europeans being more intelligent than others), in spite of clear evidence to the contrary--thus the title of the book. He debunks the methodologies and findings of ideas such as: mental capacity is determined by cranial volume, and how those who used these methods tried to fit their beliefs to their findings and preserve the idea that Wealthy White People have earned their status because they are more intelligent (this became a problem when some African skulls, and even some female skulls *gasp! *, had greater volume than their caucasian counterparts), as well as the notion of a measurable IQ. For those with a mathematical bent, the latter portion of the book explains the error of Herrnstein and Murray's calculations, and the continuing trend of partiality toward specific data that proved their hypothesis while ignoring data that might disprove it. The latter part of this trend is what Gould finds disheartening and enraging at the same time. It is symptomatic of Bad Science. That being when scientists find an abundance of evidence that points in a different direction from what they expected, yet cling to their preconceived expectations anyway, and search for a way to manipulate their data to confirm the existing bias. Imagine if Newton had at first insisted his laws of motion were based upon the energy inherent in apples, and never allowed his findings to alter his opinion. In the far future these notions of gender- and race-based intellectuality will be long behind us and we will look back in incredulity. But if not for Gould, this book, and others like him, we might never take those steps forward. If you take anything from the book, or at least the idea of the book if you choose not to read it in its entirety, it should be 1) always approach an idea with some degree of skepticism, and 2) consider the possibility of an agenda behind a proposal--even when offered by something so noble and ideal as the scientific community.